This is my detailed review of Cricket Wireless. I have used their service for 2 months now and have traveled the West coast, North East and some places in between. So far I am really satisfied with the cellular coverage, 4g LTE data speeds, affordable plans and various perks of Cricket. In this blog post, I’ve tried to share my experiences in case you want to learn about Cricket Wireless! Update: All the old referral links have expired. If you want the free $25 credit offer, use this link to sign up on Cricket! 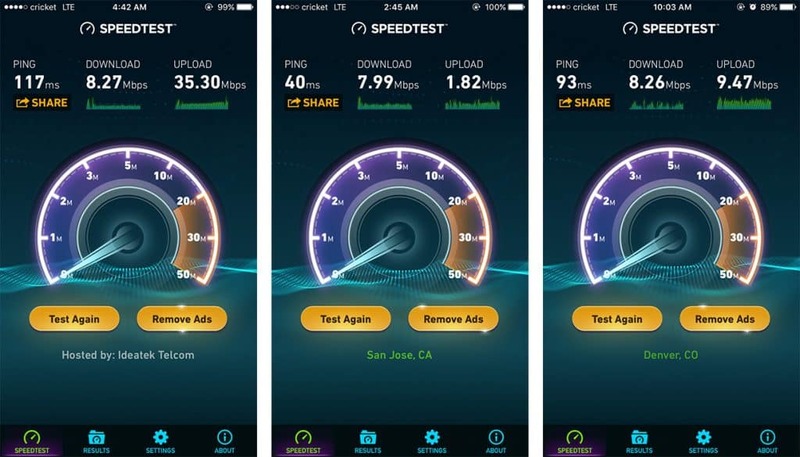 Cricket Wireless is a wholly owned subsidiary of AT&T; they both use the same cellular infrastructure which is why Cricket is able to provide much better coverage compared to other competitors. As mentioned above, I have been to the Bay area, Chicago, IL and few places urban and rural in Ohio — I have had cellular service throughout. The data speeds varied but I got enough bandwidth for streaming songs on Spotify, casual browsing, emails and iPhone app updates. I’ve included some speedtest.net screenshots below. Cricket caps the data speed to 8Mbps downstream however 8Mbps is more than sufficient for using internet. Also one would never try to stream full movies on cellular data unless they are on the unlimited plan. Cricket Wireless also has an app called “Cricket Rewards” where you collect points for participating in small in-app activities. These are completely optional. Customers can use the points to redeem gift cards to more than 50 stores like Amazon, Walmart, Target, etc and even Cricket Wireless refill cards. 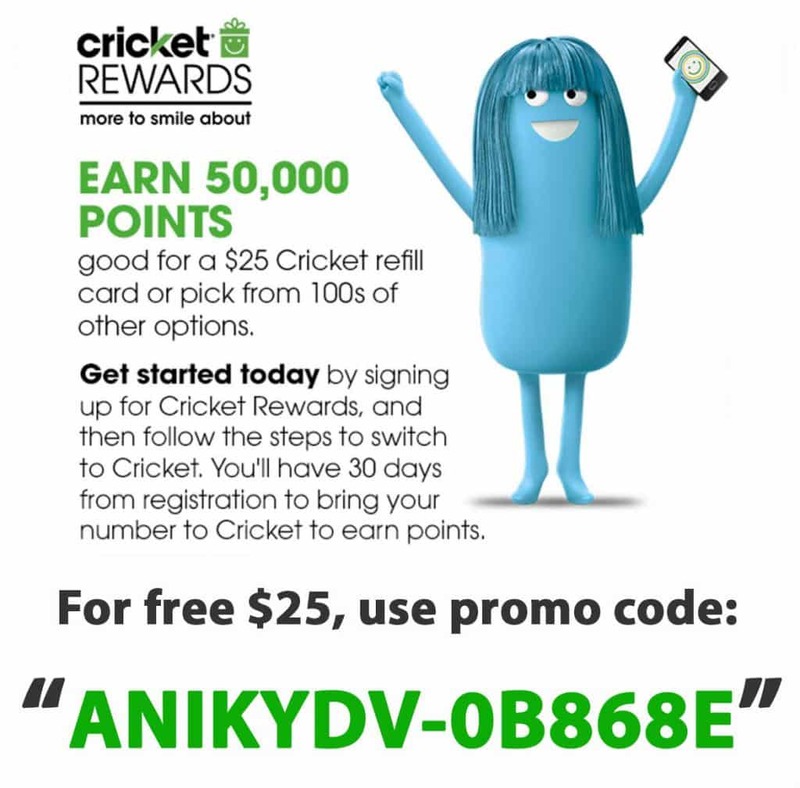 New Cricket customers who sign up for Cricket Rewards using someone’s referral code get 50,000 points for free, which can be used to redeem $25 Cricket refill card or other gift cards. All the earning/redeeming points is done through the Cricket Rewards app. If you’re looking for a referral code, use mine. The coolest thing is that with group savings, 2.5 GB 4g LTE + Unlimited talk/text costs only $20/mo! I don’t think there are other carriers that can manage to provide comparable service at such an affordable price. Another cool aspect of Cricket is the autopay discount. If you set your payment method to auto-deduct the amount at the start of each billing cycle then Cricket gives $5 discount per month! For instance if you sign up for the 2.5 GB data plan which costs $40/mo, it will be $35/mo. However, the same plan would be $20/mo if you are on a group plan with 5 people. One thing to note is that group plans are not eligible for auto-pay $5 discount because groups are already discounted significantly. Also Cricket Wireless doesn’t have additional charges related to TAX or VAT like other carriers. The price shown on their website is what you pay in total. There are no separate state tax because everything is included in the advertised price. These are Cricket Wireless’s phone plans as of now. If you set auto-pay on, there will be $5 discount OFF these prices. IF you are enrolled in a group save plan, discounts will be as mentioned below. Each member in the group can have different plans. Discounts to the group is dependent on number of people in the group, not on their type of plans. The 1 GB data plan (aka new plan) is not eligible for group save. I am personally using the 2.5GB data plan and it is more than sufficient for my needs. As mentioned, Cricket has Group Save discounts and Auto-pay discounts. Group save works just like family plan where the more people you have in the group, the more the discount. Auto-pay is $5 discount for non-group members if they set their account to auto-deduct amount at the end of every billing cycle. Besides these, Cricket also has Cricket Rewards and Refer a friend bonus. I’ll discuss them individually below. Cricket Rewards is an app by Cricket which lets you collect points. Points can be redeemed for giftcards and even Cricket Refill cards. If you haven’t signed up for Cricket Rewards, you may use my Cricket Rewards referral code. Cricket Wireless also has a referral program where both the referrer and the referee get $25 credit each. Both you and I will get free $25 credit each in our Cricket account which can be applied towards our monthly bill. When your service is active, remember to go back to the referral site and enter your new (or ported) phone number to complete the process. Only then you (and I) will get the $25 credit. Many people miss this last step and forfeit their referral bonus. Now here are some of my Speedtest results of Cricket Wireless. Not bad, eh? Cricket mentions on its website that the data speeds are capped at 8Mbps. For me it has not been a problem as the data is sufficiently fast. Last month I wasn’t able to use up all my 2.5 GB of data so towards the end I was even streaming Spotify on it when travelling. Switching from other carriers to Cricket is easy. Porting numbers takes 5 minutes and the propagation takes few hours. You will be able to do it on your table without even visiting the Cricket outlet. However Switching from Republic to Cricket is tricky. Before I came to Cricket, I was on Republic Wireless. Republic’s number is classified as a landline number by Cricket so Cricket cannot directly port numbers from Republic to Cricket. I bought a T-Mobile SIM card online for $5 and ported my number from Republic to T-Mobile. Porting numbers is free. The T-Mobile SIM came pre-activated with 30 minutes talk + SMS, which was enough for me to port my number out to the Cricket SIM which I ordered from Amazon. A few phone calls to Cricket and T-Mobile customer support and few hours later, my phone was fully functional on Cricket. Cricket is such a relief. Compared to Republic Wireless, Cricket provides more data, more coverage and for less money. I have been using an iPhone 7 with Cricket wireless and so far I have had no problems. The coverage is better than I expected. I get 3 or 4 bars almost all the time. The data always seem to work. Here’s a map from Cricket’s website as a reference. Buy the Cricket Wireless SIM card from Amazon. Last time I checked they were for $5 on Amazon and $10 on Cricket’s website. Cricket Wireless does not charge activation fee if you are switching from other carriers. Although you can BYOD (bring your own device), Cricket has huge deals on new phones. For instance, the LG X power™ for $10 and Samsung Galaxy Amp 2 for $40 and more. Also consider joining group plan for more savings. Or simply keep autopay ON and save $5 every month. As mentioned above, use referral link to sign up and get $25 in free Cricket credits. Now onto you. Are you a Cricket customer? Do you have questions or money saving suggestions? Put them down in the comments section below!